Chevron installed equipment to conduct fuel economy testing using the Volvo D12D Fuel Economy Test, a lab-based test used in Europe, in its lab in Rotterdam in The Netherlands. This kind of testing allows researchers to precisely load the engine and run it under prescribed conditions the computer controls. "Many of the OEMs have internal fuel economy tests, but most are not willing to release theirs because they are viewed as a competitive advantage," explains Gary Parsons, global OEM and industry liaison manager, Chevron Oronite. The testing used a 15W-30 as a reference oil. The results were "weighted" with factors to represent hilly conditions or flat conditions. In flat conditions, where obviously you would get the best fuel economy no matter what the oil, a 15W-40 oil performed nearly 0.8 percent worse than the base 15W-30. The 10W-30 performed nearly 0.2 percent better than the 15W-30. That's close to a 1 percent difference between the 15W-40 and the 10W-30. sir you have opened up a pandora's box. add following more lines to it. how many people buy NEW parts when needed. how many people actually read the owner's manual and attempt to reach out for skilled workshops. oil engineering is completely different phenomena. every vehicle engine is flushed & 0W-30 oil is poured into it., work out the science behind it. Manuals tell's everything what to do and what not to. Follow them. Viscosity (a fluid's resistance to flow) is rated at 0° F (represented by the number preceding the "W" [for Winter]) and at 212° F (represented by the second number in the viscosity designation). So 10W-30 oil has less viscosity when cold and hot than does 20W-50. Motor oil thins as it heats and thickens as it cools. So, with the right additives to help it resist thinning too much, an oil can be rated for one viscosity when cold, another when hot. The more resistant it is to thinning, the higher the second number (10W-40 versus 10W-30, for example) and that's good. Within reason, thicker oil generally seals better and maintains a better film of lubrication between moving parts. At the low-temperature end, oil has to be resistant to thickening so that it flows more easily to all the moving parts in your engine. Also, if the oil is too thick the engine requires more energy to turn the crankshaft, which is partly submerged in a bath of oil. Excessive thickness can make it harder to start the engine, which reduces fuel economy. A 5W oil is typically what's recommended for winter use. However, synthetic oils can be formulated to flow even more easily when cold, so they are able to pass tests that meet the 0W rating. Once the engine is running, the oil heats up. The second number in the viscosity rating--the "40" in 10W-40, for example--tells you that the oil will stay thicker at high temperatures than one with a lower second number--the "30" in 10W-30, for example. 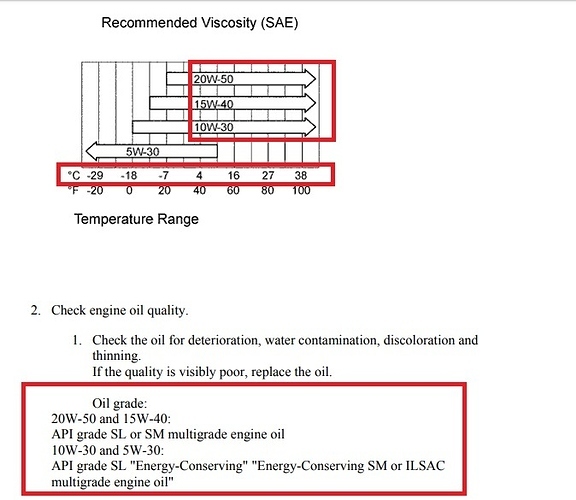 What's really important is that you use the oil viscosity your car's owner's manual recommends. If you read your owner's manual, you'll know what the car manufacturer recommends for a brand-new vehicle. The manual may include a reference to Energy Conserving oils, which simply means that the oil has passed a lab test against a reference oil. It's no guarantee of better fuel economy, but most of the leading brands have at least some viscosities that are so labeled. Resistance to thinning with increasing temperature is called viscosity index. And although a higher second number is good, the oil also has to be robust. That is, it must be able to last for thousands of kilometers until the next oil change. For example, oil tends to lose viscosity from shear, the sliding motion between close-fitted metal surfaces of moving parts such as bearings. So resistance to viscosity loss (shear stability) is necessary to enable the oil to maintain the lubricating film between those parts. Can you please explain this recommended viscosity picture? if you can not understand the above table, then the explanation is useless waste of time, which sure is precious to both of us. I got the basic idea from the posted pic. So it doesn't matter if we use 5w-30 or 20w-50 in Lahore? As both fall in the temperature range of Lahore? But its better to use 5w-30..20w50 is very thick it can be use car above 150000. There is quite a remarkable drop in fuel mileage as the oil pump has to work harder on heavier oils. It also poses a problem of oil starvation as you need ample volume of oil to reach engine parts. More oil means more cooling too. Thicker oil will cause the hydraulic relief to open very early. Even if less volume is being pumped. Specially seen in variable valve timing type engines. They rely on oil to activate that. You also have a problem of the allowed clearances on an engine bearing surfaces. A thicker oil usually tears its film formation and then u get metal on metal. Some engines are built with loose bearings like mercedes benz and bmw ones. They take the heavy stuff. The reason they are loose is because they are built to run at peak power for a long time. E.g. you can run a bmw at its top speed and rpm for quite some time. But doing the same on your vitz will mean you have no car in under 10 minutes. 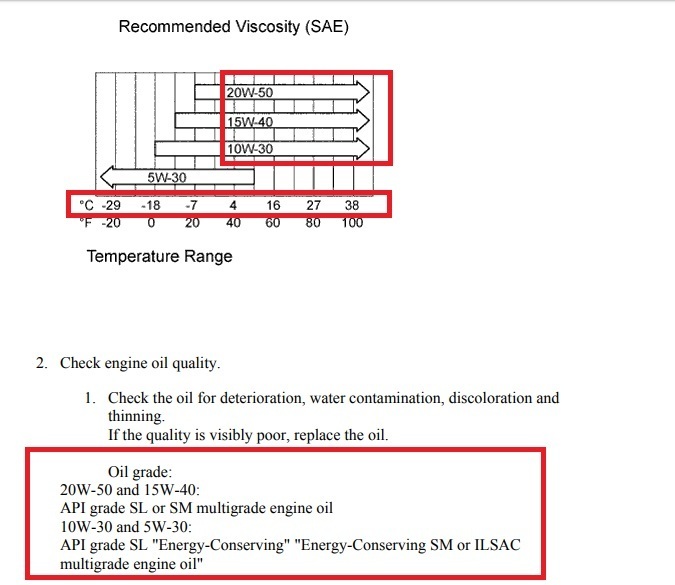 So its better to choose the correct type of oil according to the manufacturers requirement. And the lightest possible viscosity depending on the.ambient temps you expect in the future. Mostly for easier starting and also for better cooling potential. Mostly synthetics and even modern dino oils have a stiff dose of anti oxidants which prevent the oil from destroying itself from high temperature. But please remember that not all engines are same. Some maintain the oil at higher temp at all times. All in all painting oil viscosity with a broad brush will cause problems later on. Its better to follow recommendation of the equipment maker. E.g. you wont use vaseline in a balljoint. And you wont use bearing grease to moisturize your hands. Japanese dinkys imported from Japan asks for 0-w20 oils since the climate scenario is different which oil should it be ? Toyota specify 0w16 in camrys. Nissan and mazda specify 0w20 in their 4 cyls. They work sweet in tx and az. Temps for the last month have been 40c. Will thick oil not screw up the hydraulic tappets?? which jdm dinky has hydraulic lifters? - when they are manufactured, their costing papers dont even have money for black ink. You want hydraulic lifters in them?